March 31, 1997, began as an ordinary day for Lyman Spitzer. He worked on a manuscript using data from the Hubble Space Telescope which he had proposed, helped design and nurtured through construction. His paper analyzed the implications of the HST data for the theory of interstellar matter, which he had helped found. During the morning, he had coffee and talked happily about the latest developments in astronomy with his colleagues in the Princeton University astronomy department, which he had directed from 1947 until 1979. In the evening, after a full day at work, he collapsed and died at home, concluding a life of exemplary style and major scientific contributions. 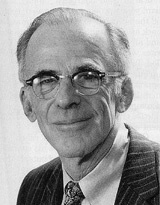 Born in Toledo, Ohio, on 26 June 1914, Spitzer studied physics at Yale University, earning a BA in 1935, after which he attended the University of Cambridge as a graduate fellow. Stimulated by Subrahmanyan Chandrasekhar's lectures and Bengt Strömgren's physically lucid papers, Spitzer moved to Princeton in 1936 to study astrophysics with Henry Norris Russell, then the dean of American astronomy. After earning his PhD in astrophysics in 1938, he spent 1938-39 as a postdoctoral fellow at Harvard University, where he met Martin Schwarzschild. The two became lifelong close friends. Following a short period on the Yale faculty, Spitzer did underwater sound research in World War 11 (his team led the effort to develop sonar), after which he returned briefly to Yale. At the age of 33, he succeeded Russell as chair of Princeton's astrophysical sciences department, and immediately recruited Schwarzschild as a colleague. Together, they created in the department an enduring cordial atmosphere of mutual support and encouragement for astrophysical research at the highest level. Spitzer's research shaped three different fields of science: interstellar matter, laboratory plasmas and star clusters. His interest in interstellar matter dated back to the late 1930s, when he was struck by the fact that elliptical galaxies contained old stars but no large amounts of interstellar gas, whereas spiral galaxies, which contained gas, also had young stars. He concluded that stars must still be forming from clouds of gas and dust, and he began a theoretical study of the physics of interstellar matter that lasted almost six decades. Spitzer worked on the theory of the heating and cooling of interstellar gases, stressing the presence and importance of interstellar magnetic fields, the likelihood of pressure equilibrium among various components and the significance of interstellar dust grains. His investigations, which established the field of interstellar matter as a rich discipline, culminated with the publication of his classic book Diffuse Matter in Space (Interscience Publishers 1968). Spitzer, Hannes Aifvén and other visionary pioneers established the foundations of plasma physics in the 1950s. Recognizing early the importance of determining the transport coefficients in a fully ionized gas, Spitzer made the initial calculations of these quantities and also the first computations of toroidal containment, ohmic heating and the diffusion losses of a confined plasma. These studies were summarized in his influential book Physics of Fully Ionized Gases (Wiley, 1956). Following up on his theoretical work in plasma physics, Spitzer convinced the US Atomic Energy Commission to try to contain and harness the nuclear burning of hydrogen at temperatures found in the Sun. In 1951, he invented the stellarator, a plasma confinement configuration. Two years later, Project Matterhorn was approved at what became the Princeton Plasma Physics Laboratory. Sited on the James Forrestal campus, PPPL became the leading laboratory in this field. After presiding over its creation, Spitzer led the laboratory until 1967. In stellar dynamics, Spitzer helped define ``relaxation,'' and showed how this process causes a stellar system to approach a singular state. Relaxation and the associated phenomenon of core collapse are accelerated by the existence of a spectrum of stellar masses but retarded by the presence of binary stars. Spitzer's many contributions to this field were summarized in Dynamical Evolution of Globular Clusters (Princeton University Press, 1987). Spitzer's seminal contributions to space astronomy are known to school children (and curious adults) throughout the world. In 1946, Spitzer proposed the development of a large space telescope. He outlined the advantages of greater angular resolution, increased wavelength coverage and more stability. These goals have guided generations of space scientists and engineers, and resulted in revolutionary discoveries. Spitzer himself led the highly successful project to develop a satellite to study the interstellar medium-the Copernicus satellite launched by NASA in 1972-which gave us the first reliable estimates of the cosmologically important abundance of deuterium. Lyman Spitzer lived a graceful life, exuding dignity and fairness. He was admired and loved by all who knew him.